Took Erika to meet Peppa, Bing, Elmo and others at the Hamleys Toy Parade on Regent Street. Then in the evening went to Harringay Green Lanes for the lantern parade. Andrew had had a rather bad week at work, so this evening we comiserated with Champagne and dinner at Oliveto. Erika wrote a letter to Santa. Went to work early enough today to just about catch a bit of the sunrise. A successful attempt to go to the zoo after last Sunday's unsuccessful attempt. Erika's friend came to visit our place for a play date, had lunch together then ice cream later on. A bit of a pilgrimage in the evening to the Bell at Aldworth with Simon. There seems to be a certain amount of up and down involved in commuting. When we first moved earlier this year, following eight years of walking to work, getting across London by tube at rush hour was rather a shock to the system. After a couple of months I began to get used to it, partly as I began to adjust my routine to avoid the worst of it, and figure out alternative routes when things weren't going well. The summer then brought a bit of a further reprieve it seemed, as a combination of people being on holiday and perhaps being more inclined to cycle or walk reduces the load on the tube a bit. Come the Autumn though, with everybody spending more time at work, the weather starting to worsen, and daylight hours shrinking, I've noticed it get worse again. I think there may also be a secondary effect that after the initial adjustment to the new norm, now a kind of longer term malaise with the reality of it has set in. Today on the way back was especially bad, which was even more annoying as I'd tried to leave early so I could get home and cook for a change - I hardly managed that at all last week. The entrance to the underground at Victoria seems to almost routinely be closed when I'm trying to get home on Mondays now. Usually it's somewhere in the region of a 10 minute wait before they determine the overcrowding on the platforms has subsided, and open the gates again. Today though it seemed to be taking even longer than usual, and I really didn't feel like being stuck in a big crowd. So after a while I gave up, pushed back through the crowd, and tried to get a bus at least part of the way. I managed to get on a not very helpful bus, which I got off again around Marble Arch, then walked all along Oxford Street to Oxford Circus, only to find the station there completely closed as well. I trudged on further from there and eventually managed to get onto the tube at Goodge Street. My commute which ought to normally take half an hour took an hour and a half. It was too late to cook by this point, so I picked up some Chinese takeaway on the way back instead. These now regular temporary station closures are apparently just a capacity issue. Given that Victoria line trains already operate pretty much back to back - there's only a minute between them at peak times - it is a bit worrying. The number of tube users will continue to grow, and some parts of the network are demonstrably struggling to cope. I wonder if any serious thought is being put into how to meet this growing demand? It did make me wonder if there could be money to be made with some kind of private bus service like Leap here in London - just for getting across the centre of London, from hubs like Victoria to Euston, without all the stops en route, and in a bit more comfort. Oh and an onboard bar, ideally. Hopefully I at least don't have too much longer of this to put up with, my office is supposed to be moving to Kings Cross some time next year, possibly as early as April (although more likely in the summer). At that point my commute should be cut in half, and if public transport completely fails to cope then worst case it should be about a 40 minute walk. As a combination of having gone to bed very late the night before, and having woken up at 5am (although I did eventually get her back to sleep) Erika slept in until around almost 10 this morning, and Chie even later (not so sure what her excuse was!). Quite a slobbish remainder of the morning ensued, and I don't think I had a shower and got dressed until pretty much midday. I'd decided we weren't going to eat out at all today, as Erika hadn't eaten particularly well at either lunch or dinner yesterday. So for lunch I threw together some sort of vaguely Japanese meal of udon, with hakusai, pak choi and a few other things in soup. I arranged the items in Erika's bowl so she had to eat through the greens to get to the noodles, I made it very clear I expected her to do her duty, and kept a close eye on her throughout. That was actually quite successful. After lunch we returned to our slobbish state, I struggled to think of anything I wanted to do, and the grey unappealing weather wasn't exactly filling any of us with enthusiasm to leave the flat. We had some vague notion of going to John Lewis to buy a rug or somesuch, but that never materialised. Eventually I thought I should at least take Erika to the playground, and she then said she wanted to go the zoo, so without giving much thought to how far we already were through the afternoon, and the impending onset of darkness, we headed in that direction. We arrived at the zoo at 3:15, only to find last admission at this time of year is at 3 o' clock, as the zoo then closes at 4. I can understand if you're going to pay the full £20 or so entrance fee it's a bit daft to only be there for an hour, but you'd think if you had annual membership as we do you'd be able to get in at any time. Erika would have been quite happy with just 45 minutes there - we could have fit in a go on the carousel and a visit to the penguins. As it was she was very upset, and it's really hard to explain to a 3 year old, who can see through the fence that other people are in the zoo, the concept of a last admission time. I did consider trying to sneak in through one of the service entrances, or bribe the zookeeper at the exit to turn a blind eye, but ultimately convinced myself that dealing with disappointment was an important part of growing up, and was character building, etc. Instead we went to the playground near the zoo, and by the time we go there she had just about perked up. She had a pretty good play on the slides, swings, roundabout etc, and I felt pleased that she'd got some fresh air and exercise. As often happens when Erika goes to playgrounds, after a while she finds a little corner and calls it her cafe (I think this behaviour harks back to one of our local playgrounds when we were living in Pimlico which had a little table and chair and a serving hatch). Whilst playing the pretend cafe there, the idea of hot chocolate sprang to mind, which seemed perfect for a slightly chilly Autumn day, as it was starting to get dark. So we walked to Camden, found a coffee shop there which served hot chocolate, I ordered two and we sat together in the window drinking them. The staff in the cafe were immediately smitten with Erika ("you're my new favourite customer!"). 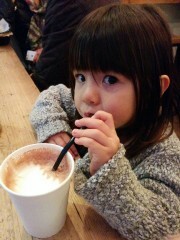 I don't think Erika has really had hot chocolate much before, and I'd forgotten how nice it can be. This was rather lovely, and the highlight of the day for me. After that we went into the Whole Foods in Camden, and shopped fairly randomly. Erika picked a lot of odd things off shelves and put them in the basket, but somehow managed to do it in a charming way rather than it being obstructive/bothersome, and again the staff here seemed to find her delightful. We bought some teddy bear shaped pasta which, along with some cannellini beans and cavolo nero formed the basis for our dinner once we got back home, and actually turned out rather well. Erika ate a decent amount as well, which was again very gratifying. Mum/Grandma had her AGM thing to attend in London today, which mean we saw her briefly in the morning (she popped up to the flat for a coffee on arriving in London before heading down to her meeting), and then again in the early evening, when we met up at dinner in St. Pancras. Between that we met a former work friend of Chie's and his family for lunch - he has a two year old daughter, and Chie thought it might be nice if she met Erika. They apparently wanted to try Great Queen Street, so that's where we went, and booked a table for when they opened at midday, so it would be quiet. I quite enjoyed the food - I had an interesting dish, simply described on the menu as "wild mushrooms and beans", which turned out to involve chanterelles/girolles, I think a bit of porcini, and cannelini beans, made into a light stew. Erika didn't really eat much though, and it was very difficult to keep her in her seat - one of those awkward situations where somebody else's child is doing something (in this case running round the neighbouring table) and it's very difficult to tell your child not to when the other parents seem fine with it. Our section of the restaurant was empty, so I doubt it was bothering any other customers much, but still I felt a responsibility to try and instil some sense of dining etiquette in her, which was obviously falling on deaf ears. I think the original plan was for some kind of "play date" (what a ridiculous term) after lunch, but I could see Erika was starting to get a bit tired and irritable, and it was raining outside, the Transport Museum obviously therefore had long queue to get in, there weren't any other obvious places to go in the immediate vicinity, so I advocated that we should just go home instead. We spent the remainder of the afternoon at the flat, did some painting and origami and various other things to keep Erika amused, before heading out just after 5 to go down to St. Pancras and meet Mum. Mums train home was at 8, and she wanted to have dinner before heading back. I'd looked through the various options in and around St. Pancras and settled slightly reluctantly on Carluccio's we just seemed the most compatible with various constraints. I'm generally not a fan of chains, and have found the food to be a bit lacklustre at this one the last couple of times we've tried it - I think the restaurant's namesake sold his stake in the chain some years ago and is no longer involved. Erika had fallen asleep on the way down to St Pancras, Chie woke her up not long after we sat down for dinner but she was not really in the best of moods for pretty much the whole meal, and only really started to liven up a bit in the last few minutes before Mum headed off to get her train. Again, she didn't really eat anything. I resolved to just eat in all day tomorrow. After waving Mum/Grandma off we got a taxi on the way back, as it was still rather unpleasant weather out, and I didn't want to be back too late. Erika finally ate her dinner - which we brought back in a takeway box for her - around 9pm, and we didn't manage to get her to sleep until almost 10. Rather a frustrating day from a parenting point of view, all told. I seem to have been rather craving the countryside recently - this has manifested itself both in our excursion to Huntingdonshire last weekend, and my plan (which has been postponed) to go to the Bell at Aldworth earlier this week. Moreover I've been wanting to escape the dull drudgery of modern attire which I get crammed up against on my commute to and from work every day, and, while we're at it, just escape the commute altogether, which I've really not been enjoying the past couple of weeks. Roll on the move to Kings Cross next year. So since being reminded that The Open was on at Cheltenham Racecourse, starting today (sort of a lesser version of the Festival in March) a few days ago I hadn't been able to get it out of my mind. I had ummed and arred about whether I would actually go, what with the weather not looking too promising, and the fact it was a bit of a trek to get there, but by this morning the urge was overwhelming. So I donned my tweed suit and, with some irony, got on a horribly overcrowded commuter train to Paddington. From Paddington the journey was a lot more civilised, it was easy to find a seat, and it seemed most of the other people on the train were also bound for Cheltenham Racecourse. From Cheltenham to the course a shuttle bus was laid on, and by around 12:30 I was there, admiring all the tweedy outfits and feeling very pleased that I had made the effort. I don't think anybody I know really gets why I enjoy coming to Cheltenham so much - it's my third time now (two festivals, and this was the first time at the open). Whilst I do always have a flutter on the horses, since I'm here, the racing is actually secondary to me to the anthropological fascination of being in such a high concentration to the sort of people I assume to be the core readership of Country Life. And not the aspirational types who daydream unrealistically as they're flipping through the full page property ads for sprawling country estates, but the people who actually live in those grand houses. On arrival I headed straight for the new grandstand, which was officially opened by Princess Margaret today (alas I missed the ceremony by half an hour or so, and the Princess Royal had by this point, presumably, retreated to a private box). I took a quick pass by the new Champagne bar there, but it seemed perhaps too new to have yet developed much character, so I instead decamped to the more familiar setting of the Golden Miller bar in the older grandstand. This seems to be where many of the more well heeled racegoers congregate, and the combination of particularly elegant tweeds and ubiquitous Champagne bottles is something I always find rather exciting. As for the actual racing, I put a modest bet or two on every race apart from the last one, and overall made a slight profit thanks to a bit of luck in the 2:15, but really all of that played second fiddle to the people watching, which I just found spellbinding. The other highlight was discovering there was a Gwatkin Cider stand there - I'd never seen that at the two previous visits to the Festival. That led to a bit of internal conflict, I had intended to spend the afternoon nonchalantly quaffing Champagne, but on finding Gwatkin I instead worked my way through their ciders and perry and somehow didn't feel like going back to the fizz afterwards. I noticed with the exception of one or two ladies ordering the hot cider, motivated almost entirely by the chilly weather, the tweed wearing classes were not really patronising the cider stand at all. I left before the last race, keen to get an early train so I'd be back in London before Erika's bedtime. So in the end I spent over 7 hours in transit today, for the sake of only spending about 3 hours actually at the racecourse. But I still enjoyed it, in my own bizarre way. Since Chie finished work at the start of October Erika just goes to nursery on Tuesdays and Thursdays. I thought it might be nice for me and Chie to meet up for lunch one of those days, but as it turned out I had to book this some time in advance, as Chie had such a busy schedule of lunches with her surprising number of Japanese friends who also don't have day jobs. Although we do eat out with Erika quite a lot, we tend to restrict the sort of places we chose to go to when we do so, obviously in part to places where we don't think we're going to be sneered at for showing up with a toddler, but also where there's cuisine on offer which is going to suit a 3 year old's palate. She is fairly open minded, but not unreasonably can't really stomach anything spicy, so now and again Chie and I have a bit of a craving for Indian food. Thus today, combining that requirement for Indian food, plus wanting to go somewhere a bit upmarket (again the sort of place we might not choose if we were with Erika), and the fact that I didn't want to go too far away from work, led to the obvious choice of the Cinnamon Club. We've both been a bit nonplussed by upmarket Indian places in the past, but thought we'd give the genre one more go, and this time keep it relatively simple - rather than going overboard with a longwinded (and usually disappointing) tasting menu, we stuck to the set lunch menu. I started with a "kidney bean kebab" which I struggled to get excited about from the description, but had to concede it was actually very well flavoured. My main course was in safer territory, involving paneer, and was probably the most convincing argument I've had to date that upscale Indian as a cuisine was actually worth bothering with. This demonstrated a very refined use of spices, and managed to be rich and satisfying without swimming in ghee, whilst also avoiding the common trap of restaurants at this end of the Indian food spectrum of being too fussy and awkward. Really liked the interior as well - the old Westminster Library makes for a grand setting. I think Chie must have liked it too, as at the end of the meal, after we'd settled the bill, she decided to just linger longer with her massala tea and petit fours while I dutiffully hurried off back to work. Not much to report really. Usual late weekly meetings at work which didn't finish until around 7:30, after which I headed home, and attempted to eat my dinner simultaneously while reading Erika a bedtime story. That turned out to not be particularly easy. I had originally booked this evening off from parenting duties so I could go on something of a pilgrimage, out of London, to the Bell at Aldworth. I was planning to go with Simon, but as it turned out he was ill this week, so we rescheduled for next week. During the day it became apparent that the usual suspects (Andrew and Jim) at work were keen to go out for a pint or two. So instead of the long trek out to the wilds of Berkshire, I took them on a tour of some old favourites in central London, starting at the Blackfriar, by way of Fleet Street (the Crown and Sugar Loaf, the Old Bell, Ye Old Cheshire Cheese). Ricardo joined us briefly at the Old Bell, and therefore the usual surreal conversations ensued ("What's the opposite of a beard of bees? ", etc). As Christmas looms, we had recently been discussing decidedly (a different adjective was employed) quaint venues for pre-Christmas drinks. 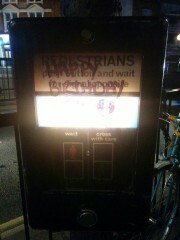 Last year this had taken us to Hampstead, a hard act to follow in quaint terms. To this end I determined to include Ye Old Cheshire Cheese on tonight's itinerary, which, despite being on the tourist trail, in the original bar by the entrance, complete with an open fire and sawdust on the floor, is, in my opinion, pretty bloody quaint. Not sure the chaps were that impressed though. Our actual "official" pre-Christmas really-very-quaint outing looks set to be headed for Oxford, or thereabouts, but recent discussion of the thirst for quaintness was part of what reminded me of the Bell at Aldworth. The rest of them seemed to have had enough after Ye Old Cheshire Cheese, by which time it was only just gone 9 o' clock. It seemed a waste to me to just go home at that point, so I headed on from there to the possibly even quainter Ye Old Mitre - which was delightfully quiet by that time on a Tuesday evening in the first half of November. And, from there, a final nightcap at the Whisky Society, before, just for fun, getting a proper train rather than the tube back home from Farringdon. Chie had picked up a cold and wasn't feeling at all well today. So whilst in the new scheme of things (since Chie gave up work) Erika normally wouldn't go to nursery on a Monday, this morning I called and asked if they could have her so Chie could get a bit of a rest. I dropped Erika off at nursery, which I haven't done for a while now, and then headed off to the office. Not much else to report really, Spanish food for dinner in the evening. Having bought a very modestly sized flat, in a part of London which is hardly Belgravia, it's not an unrealistic prospect to think seriously about one day having a second home somewhere a bit, well, nicer. Whilst most people in our position seem to just focus on saving their pennies to buy a bigger place in London, maybe even a house, I'm not really that enthused by the idea of shovelling more cash onto the London property bonfire, and given that a spare bedroom could easily cost us three hundred grand, I can't help but think of all the things you could do with that money instead. Whilst I'd always rather liked the idea of Herefordshire, or of course somewhere near the sea, Robin had very sensibly pointed out that if a place is too far from London we'd end up hardly ever going there, and it would just be a waste. So given my office will be moving to Kings Cross next year, I thought it might make sense to look at places which you can get to from Kings Cross within, say, an hour, but which felt fairly rural. Thus today we decided to have a look at Huntingdon / Godmanchester. I rather liked the idea of a defunct county - Huntingdonshire - and I'd seen pictures of neighbouring Godmanchester which looked quite nice. Possibly not the nicest of weathers in which to experience the area - it was rather grey and a bit chilly. Regardless though, on arrival at Huntingdon station we trudged dutifully across the meadows to Godmanchester, where we were greeted by a very Autumnal scene - a large tree which had shed most of its leaves, overlooking the famous Chinese bridge. It was quite a nice spot, despite the weather. It would have been nice to have had the time to wander round Godmanchester a bit more, which seemed to have some quite attractive houses, and looked generally quite pleasant, but we hadn't left London quite as early as I would have liked, and lunchtime was already upon us, so I thought we should proceed quickly to the place I'd chosen to eat - the King of the Belgians pub, in Huntingdon/Hartford. En route as a surprising coincidence we bumped into a family we know from London who we often see at the playground next to Erika's nursery. The King of the Belgians was very much a locals pub, and I found it rather delightful. Both the owners and the locals were all very welcoming, and the food was hearty and had a definite home cooked feel. Chie had an appointment back in London later in the afternoon, so we had to make a swift exit from the KOB once we'd finished out lunch, and had booked a local taxi to get back to the station. Once back at Kings Cross Chie went off to see her friend, and Erika said she wanted to get the bus back home. On balance, whilst I quite liked our little foray into Huntingdonshire, I'm not sure we were sufficiently taken with it to seriously think about buying a place there. Maybe we hadn't really given it a fair crack of the whip given the weather, but I couldn't really imagine living there. We tidied the flat in the morning, and Chie decided to move the dining table from the corner of the lounge to the kitchen. Although it's a bit of a squeeze in the kitchen, it does open up the lounge a bit, gives Erika a bit more room to run about, and it's nice that she can sit close by when we're getting meals ready etc. Having carefully tidied up, we didn't want to mess it up by cooking or anything, so went out for lunch to our little neighbourhood pasta place. After that I took Erika for a quick ice cream, then set about trying to get her to have an afternoon nap, as she had a friend coming to visit later in the afternoon and we knew she'd be hard work if she didn't have a sleep first. This proved to be a bit of an undertaking, Erika will still only really sleep in her buggy whilst out and about, and it was raining quite heavily. I trudged determinedly through the rain until she eventually fell asleep, thinking that as a reward for my efforts I might have a quiet pint at the Camden Town Brewery. On arrival there was a load (and not particularly tuneful) band playing, so that was obviously not going to happen, which, given the awful weather, meant I was a little bad tempered by this point. Instead, I took Erika back home, deposited her there whilst still dozing, and trudged off to the Southampton Arms to cheer myself up. After one quick drink there, it was time to go and meet up with Beatrice and her parents - a friend of Erika's from her previous nursery, at Bear and Wolf. Erika was then determined to invite them back to our place, which we did, but she did not exactly make for an excellent hostess. She wasn't prepared to share any of her toys, and when I tried to entertain the girls with the "rainy day game" (which consists of trying to find a rubber duck) Erika threw a tantrum when Beatrice found it first. Beatrice's parents don't even drink, so I couldn't attempt to compensate by plying them with Gevrey Chambertin. Instead they decided to head home at that point. So that was not a very successful play date. Erika hadn't really seen any of the fireworks yesterday, so we thought it might be nice to take her along to the very child friendly display held this evening at Coram's Fields, which started at 5pm. So I left work early and met Chie and Erika there. We were also joined by one of Erika's friends from nursery, her parents, a friend of Chie's and her son, and also coincidentally bumped into one of the teachers from Erika's nursery. Although Erika liked the build up to the fireworks, dancing around with her friends and their glow sticks, once the actual display started it quickly became apparent she really didn't like fireworks at close quarters like this. It was pretty loud I suppose. I tried to make it better by moving a bit further back, and then tried to distract her with a go on the teacups ride they had set up in one corner of the park, but she clearly just wasn't happy with the noise. So I did my best to take her out of the park, which turned out to be a bit of a feat - the entrance was very overcrowded, and it was actually worrying - given the presence of pyrotechnics it wouldn't be that hard to imagine some kind of accident taking place, and then lots of people would be pretty much trapped. Took Erika to the nearby Brunswick Centre while we waited for Chie to get out of Coram's Fields, and once she eventually did, we had a quick dinner at Itsu (Erika wanted to eat sushi), before making what felt like quite a long trek home, partly on foot, then the remainder by bus. Really should have put my foot down and just got a taxi. Once back at home I rustled up dinner 2 (there wasn't much for me to eat at Itsu) - the rest of the tagliolini I'd brought back from Italy, along with dried porcini from Bassano del Grappa, and the bottle of Gevrey Chambertin Mum had sent the other day. Delicious. Rather lazily picked up Chinese takeaway for dinner, knowing as Erika had been to nursery today, where they have tea at around 4pm, that she wouldn't eat much for dinner, so it didn't matter so much if it wasn't particularly healthy. Erika apparently hadn't had an afternoon nap, so was a bit tired, and we managed to get her to sleep by 8:30 - which is pretty early by her usual standards. I was keen to get outdoors after that and see if I could see any firework displays. After a brief walk around the local area I determined there wasn't going to be much visible there, so decided to hop on the tube, and ended up heading for the Angel in Bermondsey. This turned out to be quite a good vantage point - there wasn't any single big display visible from there, but a few small ones, and it was definitely enough to keep me entertained during my time there. On the way home I decided to stop off at the George Inn in Borough, predicting it being later on in the evening that it would be fairly quiet. This turned out to be right on the money, and in fact I had the oldest and nicest bar room all to myself - with the exception of a rather sweet looking little mouse with big ears who scampered back and forth across the floor a few times, apparently not all that concerned by my presence. It was rather blissful. Received a case of my favourite Gevrey Chambertin today - Domaine Fourrier 2011. For a while now I'd been wanting to actually start stocking a cellar, since our flat has one which isn't much use for much else other than storage of things we don't mind being in the dank atmosphere. I had also recently ordered a logging thermometer and hygrometer to check that the temperature and humidity remained reasonably constant overnight etc - at least last night it had stuck around 15 degrees and 75% humidity which is apparently about right. The delivery arrived first thing in the morning, to the extent that I signed for it in my Cordings pyjamas, which felt gratifyingly louche. I decided to install the bottles in the cellar straight away, after liberating one of the wine racks I'd bought earlier this year, which had been co-opted as a magazine rack and occasional foot stool. It seemed much happier with 6 bottles of Gevrey Chambertin in it. Popped to the Red Lion on Crown Passage briefl after work. Also got my new data logging thermometer/hygrometer today - to check the conditions in the cellar. Stroll across Hampstead Heath on a misty Sunday morning. Took Erika to a Halloween themed Baby Loves Disco in Clapham the afternoon, and then in the evening we received hordes of trick or treaters. Received a bottle of Gevrey Chamberin from Mum - lovely surprise! First time to experiment with some of the bottles I brought back from Italy. Mum's friend Dominique was visitng from France, and we met up in St Pancras in the early evening today. First full day with Erika after the girls returned from Japan. Went to the zoo in the morning, and carved a pumpkin for halloween in the afternoon. Quick pint with Al after work, followed by a swift dash home to smarten up a bit, then cocktails at Dukes with Natalie and Tomasz. Just one picture of a nauseating post-it note I spotted at work. A Sunday back at home doing quite English things after my week in Italy.